(Annapolis, MD)- The J/22 class continues to gather new, passionate sailors from across the spectrum of experience. The class strong holds- Chesapeake Bay, Lake Minnetonka (MN), upstate New York (Rochester/ Youngstown)- continue to see good participation in many events over the course of the season. And, other areas continue to see increasing activity in places such as Texas, Narragansett Bay (RI), New Orleans (LA), and Ohio. A big fleet has gathered together to sail the 2018 edition of the J/22 World Championship from September 9th to 14th on the Chesapeake Bay, with Annapolis YC hosting sixty-five entries from the USA, Canada, and The Netherlands. On the international front, there are six teams from Canada, including Trevor Collins’ ALTERNATIVE GIRLFRIEND, Sylvain Gougeon’s POLO, and John Koppernaes’ RAISED J. Plus, there is one team from The Netherlands- Auke Holtrop’s ROTTERDAM WORLD GATEWAY and one crew from South Africa- David Waiting’s SOLSTICE. As for the Americans, it appears the class is increasing its depth of talent overall, as well as seeing a significant uptick in women-skippered teams (nine, as a matter of fact!). As for the women, a long-time class leader has been Sandy Adzick’s HOT TICKET from Severn Sailing Association, she was a 3x College Woman All-American at Boston University, and is consistently near the top of the leaderboard. Her good friend Cory Sertl from Rochester, NY (and summers in Jamestown, RI) often sails with her husband Mark and, as skipper, she has won numerous regional events, was US Women’s Sailing Champion, and has demonstrated she can finish in the top 10 in National regattas. In addition, other women helms include Sylvain Gougeon’s crew from Quebec on POLO; Koralina McKenna’s GODSPEED from SSA in Annapolis; Susan Mattis Turnham’s STELLAR JAY from Duluth YC in Minnesota; Karen Glass’ FOLKA from SSA; Julie Neal’s DONE DEAL from Wayzata, MN; Lynn Simpson’s BLING from LCYC in Texas; and Nicole Curran’s ATAATA from Riverton YC in Philadelphia, PA. The balance of the fleet is formidable, including several World, North American, & Midwinter Champions. No question, the United Kingdom’s Ladbrokes Betting Parlour (famous for sports betting) would have a hard time putting odds on this hard-core group of teams; they include Allen Terhune’s THUNDER CHICKEN, Brad Julian’s USA 677, Jake Doyle’s ZESTY ENTERPRISE, Jeff Todd’s HOT TODDY, Zeke Horowitz’s UNCLE FLUFFY, Mark Foster’s PRESSURE DROP, Chris Princing’s EVIL DR PORK CHOP, Mike Marshall’s BAD NEWS, Kevin Doyle’s MO’MONEY, Chris Doyle’s THE JUG 4 1, Travis Odenbach’s YEM, Bill Draheim’s FINN, and Pete Levesque’s DUSTY. It would not be surprising to see this group of boats take most of the podium finishes all week long (if not all of the top five); in other words, picking a winner now would definitely be a “fool’s errand”! 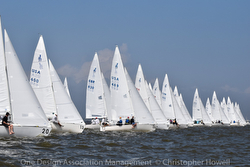 For more J/22 World Championship sailing information Add to Flipboard Magazine.